Grades 1-8: Monday - Friday from 7:45 a.m. to 2:45 p.m.
Pre-K and Kindergarten: Monday - Friday from 7:45 a.m. to 2:30 p.m.
For Casual Day early dismissal dates see calendar in back of this policy manual. Supervised hours are Monday - Friday from 7:30 a.m. to 3:00 p.m.
Students are not to arrive for school before the school doors open at 7:30 a.m. Students are to go directly to their classrooms. All students shall leave the school promptly after dismissal and go directly home. Students awaiting parents after school are to wait in the areas designated by the principal and follow the directions of the After School Duty teacher. No ball playing is allowed and students are not to use the playground equipment before school or while waiting to be picked up after school. The school assumes responsibility for the supervision of the students no longer than fifteen (15) minutes before and 15 minutes after the regularly scheduled school hours. Beyond that time, the safety of the student is the responsibility of the parent or guardian. Any Student not picked up by 3:00 p.m. will be sent to CTK After School Care and you will be required to pay the drop-in charge. (Fees for After School Care are available in the school or church office). Written permission by the parents for the students to walk or ride a bicycle to and from school must be on file in the school office. Students will not be allowed to leave the school campus without this written permission. Students will not be allowed to leave school early and bicycle or walk home. Students must be signed out by a parent. If school is dismissed early due to inclement weather, students will not be allowed to bicycle or walk home. If student arrives at school after the 7:45 a.m. bell they must report to the school office to be checked in for the day. When leaving during the school day for any reason, please sign him/her out at the office. He/she will be called to the office by intercom. Pupils are expected to be in attendance at all times when school is in session unless illness or an emergency prevents it. Generally, a pupil who has accumulated 25 days of absences during the school year should repeat the grade, or will be required to attend summer school. Proof of attendance at summer school must be presented at the time of fall registration. At times absence due to illness or family emergency is unavoidable. If a child is absent, please call the school office before 9:00 a.m. or send a note to the office via a brother or sister. When calling to report the absence, you may also request homework to be left in the office or sent home with a brother/sister or friend. (Elementary only - Jr. High students can call a classmate or check Ren Web for assignments.) The work may not be picked up in the office until the end of the school day. UPON RETURNING TO SCHOOL, THE CHILD IS REQUIRED TO BRING A NOTE TO THE CLASSROOM TEACHER STATING THE REASON FOR HIS/HER ABSENCE. Students are given comparable time to days absent to make up missed work. When requesting a student to be dismissed from school for any reason, parents are to submit a WRITTEN REQUEST IN ADVANCE to the school office. For the SAFETY OF THE CHILD, the parent or other authorized person must come to the office to meet the child. When parents take children out of school for vacations or trips, the PRINCIPAL AND THE TEACHER must be notified IN ADVANCE. Parents assume full responsibility for the education of the child. Teachers are not required to write out lessons in advance. Upon returning to school from an absence, a student must approach his/her teacher and ask for tests and assignments to be made up. No student may leave the school premises during school or absent themselves from school sponsored functions and events without express permission of the principal. A student who violates this rule will be subject to disciplinary action at the principal’s discretion. Promptness is a trait to be developed. Parents, through their efforts, help instill this trait in children. A child is considered tardy for school if he is not in his classroom when the 7:45 bell rings. Tardiness interferes with a child’s progress in school and constitutes a disturbance for all members of the class. IF A CHILD COMES IN LATE, THE STUDENT AND PARENT (OR DRIVER) MUST REPORT TO THE OFFICE FOR A PASS BEFORE GOING TO THE CLASSROOM. If a student is tardy three times for an unexcused reason, it will equal one day absent. In addition, after three (3) unexcused tardies, the student will sit out fifteen (15) minutes of recess. Parents or visitors who wish to order a cafeteria lunch must call the school office before: 8:30 a.m. If you would like to bring a lunch for yourself or your child(ren), just come by the school office to check in and get a visitor pass before proceeding to the cafeteria. Students may charge lunches on a daily basis and parents will be billed through their FACTS account. Any visitors wishing to purchase a school lunch will be charged to the child’s family account. If a child’s lunch has not arrived by the time his/her class eats lunch, a tray will be ordered for the child. School closings because of inclement weather will be announced on major radio and television stations. Parents/guardians will be notified via text message, phone call and /or email message as indicated within RenWeb. 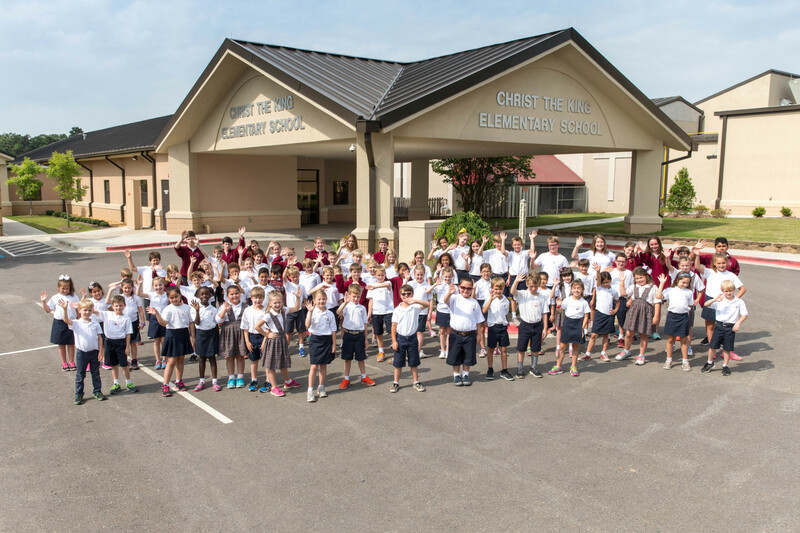 In case bad weather necessitates the closing of school, Christ the King will abide by the decision made for the Catholic schools by the Diocese. On days we have a delayed opening because of the weather, be aware that the faculty or staff may not be at school at 7:45 a.m. If the roads are hazardous, we cannot guarantee that someone will be here when you drop off your children on your way to work. If the school closes, or there is no school due to inclement weather, NO extracurricular activities will be held that day, i.e. basketball games, practices. PLEASE NOTE: If school closes due to inclement weather, CHRIST THE KING AFTER SCHOOL CARE is also canceled.